I’ll admit it, I was wrong! All this time I have thought, hell, fervently believed there were only three ways to get rich: (1) Inherit it, (2) Steal it, or (3) Earn it. Except for the first choice, none of those sound particularly fun; but, it turns out there is another way, a far better way and one that can be a bucket of fun, gaming enthusiasts. Did you know that computer gaming is now considered a professional sport? For example, just last month U.S. immigration officials classified the world’s top video-game players as professional athletes. Wow, does it take forever for the U.S. government to wake up, or what? We all knew how special gaming was, but all we got from the government was a lot of crap. Anyway, Immigration officials issued visas to certain gamers from abroad. These visas allowed them to visit the United States more easily for tournaments. That’s right, tournaments, where opposing players stand-off against one another to see who is left standing. Not only that, like professional football, basketball or soccer, there is a heck of a lot of money at stake for the best players. We’re talking hundreds of thousands of dollars. Apologies to those who already knew this, but it was news to me. Now I have to brush up on my mouse skills. The players, domestic and foreign, have earned the right to be called professional athletes because the federal ruling was passed on a gaming metric known as APMs, or actions per minute. It seems the government has finally recognized that games require incredible dexterity; and oh yeah, and not only dexterity, but remarkable visual acuity and mental agility as well. And that’s to play them for fun… it has nothing to do with the level of skill involved with doing it professionally. Having now watched a couple of YouTube videos on the subject, I realize that professional gamers aren’t just good, they’re practically inhuman. Hopefully the next OJ Simpson is not among them. Anyway, the government has accepted that these attributes required to rule in games like Call of Duty or StarCraft II is so extraordinary it constitutes athletic prowess. That prowess, in many cases, is considered to be well beyond that of the typical athlete because much of it requires mental conditioning, and a high level of reasoning as well as physical capability far beyond the average. That list, if I remember Starcraft II, would take me about 15-20 seconds to get through. And this would go on for much of the game. Being – at best – an average Starcraft player, it would feel pretty fast paced to me. A professional Starcraft II player would issue those ten commands in less than two seconds. In fact, professional Starcraft II players usually get through 200-500 APMs on average. “Mental conditioning, high level of reasoning, and beyond-average physical capabilities” indeed. So, come out of the closet now, or the home office, or rec room, or whatever. We can pull out our wing-wangs and pee on our favorite Florida ex-attorney. You can mock many of those arrogant Congressmen and Senators who have screamed at the top of their lungs about the dangers inherent in video games. In some realms, gaming is now respectable, so respectable some of the top players earn well into six figures. That’s enough to turn anyone’s eye, or at least their pocketbook. It certainly would cause me to practice digit-loosening instead of calf-tightening. You can now mock all those characters who show off their biceps, massive shoulders that can’t lift a glass of milk they are so clumsy. Now all this didn’t happen by accident. We owe much of our sudden respectability to the MLG, better known as the Major League Gaming. It’s one of the handful of private efforts to standardize pro gaming into a quasi-official league along the lines of most pro sports. That name sounds a bit like a bunch of guys that got together to make sure the slots and tables in Las Vegas were legitimate. In fact, one of the odder problems “gaming” faces is that the term was associated with gambling long before it was associated with our hobby. But, hey, this thing really exists. Not only does it exist, Major League Gaming is America’s foremost video gaming league. It sponsors events that pay big prizes. The MLG is currently sponsoring a long awaited face-off between FaZe and Impact, considered two of the world’s top teams. They will be battling one another using Call of Duty: Black Ops II. A 2010 MLG event in Dallas. For the last decade, the MLG has been working assiduously to get gaming recognized as a professional sport. Indeed, it has emerged as the NFL of professional gaming. They have, virtually single-handedly, turned video games into an organized form of sport. Better yet, because of their influence, it has also become a very lucrative sport. But, before you get too carried away, remember, this is not “kinda-like” professional sports, it IS professional sports, and as such, very few make it to the top. Sound interesting? Sound like you could make the cut? Well, read on. Who knew? Who knew that MLG has accomplished so much and pretty much under the radar. Live-streamed matches are common events…who knew? 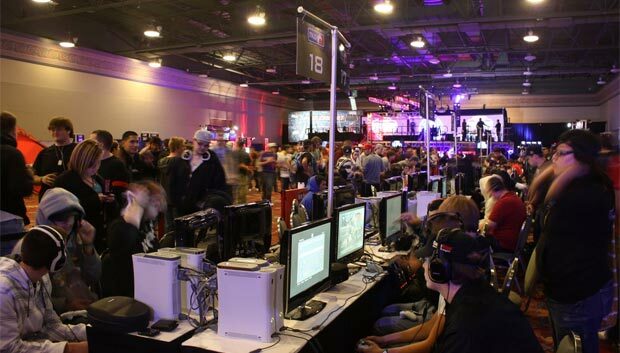 Of course we are all used to arena matches, many of us have no doubt even played in a few when we attended this or that gaming convention. But the fact is, gamers clearly have come miles and miles from the days when they lined up in an arcade with a pocket full of quarters, hoping against hope to get the high score, thus gaming fame among their friends and colleagues. That looks pretty silly now because the willing, the able and the talented can forgo the high score in favor of the high dollar. I saw this as a great way to increase my bank account. Gaming? I can do that! Of course, then I kept on researching, because all this professional stuff was news to me. And it turns out that becoming a pro gamer able to make a living at the job is about as easy – and about as likely – as becoming a pro footballer. These guys (girls too, not as many today but hopefully that ratio will even out) typically take their show overseas, because as big as pro gaming is in the United States, it’s nothing compared to how big it is in Korea. But moving to Seoul is the easiest part of this journey. Those few capable of making pro teams can expect to practice ten hours a day, every day, month in and month out. It’s similar to boxing, since the prep is usually geared toward one or another specific upcoming event. They’ll put thousands of hours in to get ready for a ten or fifteen minute tournament during which a single mistake could cost them thousands, not to mention their career. 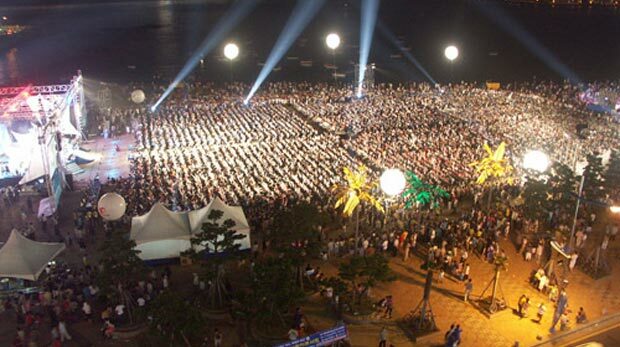 It’s been huge – 150,000 live attendees huge – in South Korea for years now. This small-ish (for them) outdoor extravaganza took place in 2005. Still, if you can do it, it’s a viable way to make a living. The really ironic thing is that in typical fashion, the younger generation of gamers with rebel. I can see it now, because mom and dad insist on it, we won’t do it. I mean heck, did you run out and get a job when they asked you to? Did you really care about supplementing your parent’s income to help pay for college? It is believed in the very short term, this sport could easily grow greater even than MLG’s current expectations. There is talk of developing farm systems for gosh sakes (they already exist in Korea). You don’t believe it? Well check out a book by an Associate Professor at MIT. His name it T.L. Taylor and the book is Raising the Stakes: E-Sports and the Professionalization of Computer Gaming. And further, lest you think this is all a joke, you should be aware that MLG was founded by a couple of friends in 2002-2003. It was supported wholly by donations from the founders themselves and anyone else they could con into giving a few bucks to support their dream. By 2006 Oak Investment Partners, a venture capital firm took an interest and by 2012, they had invested nearly 60 million dollars in the idea. Amazing what a couple of buddies can do with a good idea, tenaciousness, and a hell of a lot of work. MLG is expected to be profitable for the first time this very year. Lest you think that is not such a big deal, think of the National Football League or Professional Baseball, leagues that control hundreds of millions of not billions of dollars. MLG is simply the newborn baby brother, just learning to walk. As a matter of fact, in the next couple of weeks, it is expected that MLG will make public a partnership with a film and TV studio to develop projects to integrate MLG efforts into their broadcasts. Want to know more? Check it out at www.majorleaguegaming.com. You will learn all you need to know and then some. And by the way, when you reach the six figure income, don’t forget where you got the tip. Two-Toes wants his 15%. E-sports have been a recent topic of debate amongst my weekly board game group, so I was thinking about writing about it at some point. Instead I shall simply link here. Wow, that video! Great article. We had a conversation at work a whileback as to whether Starcraft should really be considered a sport. Most of us agreed that it took some physical prowess to pull the game off at this level… even when sitting down. We held a gaming convention last June and wanted to hold some tournaments. We partnered with a local league called Green Light Gaming. I learned how serious they are about this venture, and I also learned how much of a pain it is to find adequate internet speeds for modern games. Overall, there is good money in organizing and pushing the sport and if you can handle the typically fierce egos that that it attracts, it’s pretty fun.